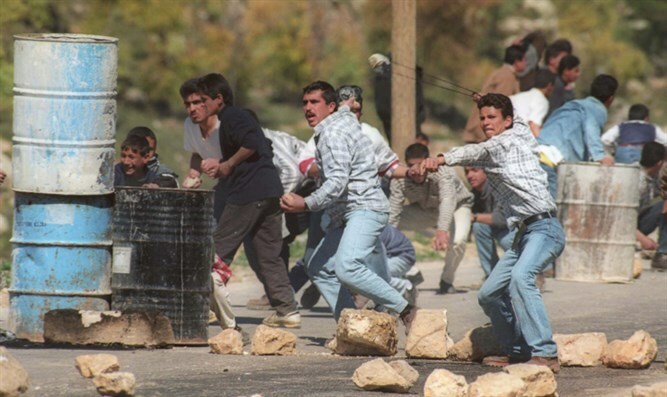 Arab lynch mob attacks Jewish children hiking in Samaria. Three Jews injured, one terrorist killed, another wounded. A group of children from Samaria, who left Thursday for a planned trip approved by the IDF near the Samaria town of Migdalim, was attacked by an Arab lynch mob. Medics treated two Jews who were lightly injured in the attack. They have been evacuated to Beilinson Hospital in Petah Tikvah. Some 25 children and two adult escorts departed on the trip, which took place a significant distance from Arab villages. At a certain stage dozens of Arab rioters began to attack the participants in a planned ambush. The rioters threw stones and rocks at the children and the youths, and the group was forced to take refuge along the steep cliffs nearby, thus facing danger to their lives both from the rocks thrown at them and the dangerous terrain. Miraculously, the group found a cave in the area, where it hid until the arrival of the army. During the stay of the young men in the cave, the rioters attempted to enter the cave and lynch the hikers. A military source said the boys were on a private bar mitzvah trip and were hiking from Migdalim toward Kida. Dozens of rioters then arrived in vehicles, attacked the boys and lightly injured three of them. A parent of one of the youths who was escorting the group was forced to open fire on the attackers. Two of the rioters were hit by gunfire, and despite attempts by IDF medics at the scene to resuscitate him, one was declared dead at the scene. Samaria Regional Council head Yossi Dagan, who was in contact with IDF command, said, "I am sorry that this has to happen when a group of students wants to tour the area, and I give my support to the escorts, who were resourceful and protected the students' lives with determined action against the rioters." The Honenu legal organization said that the group's adult escorts were forced to fire deterrent shots into the air, but the terrorists were undeterred and continued to attack the group members. At one point, according to Honenu, the rioters managed to reach one of the security guards, attacking him and grabbing his weapon. The security guard was injured by stones thrown at his face and is receiving medical treatment at this time. The lawyers from the Civil Division of Honenu filed an urgent complaint with Israel Police, demanding the arrest of all the rioters who tried to murder the children.